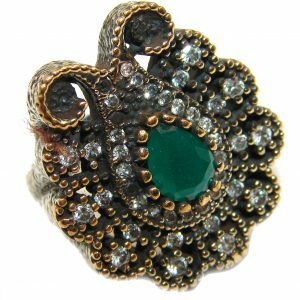 How many women do you know who wear emerald engagement rings? Not very many and that’s understandable when you consider that diamonds are the ubiquitous choice for engagement rings. But did you ever wonder what kind of woman wears an emerald for her engagement ring? Believe it or not, receive an engagement ring of a sparkling gemstone other than a diamond can be more memorable. More and more celebrities, in fact, have been receiving marriage proposals with gemstone engagement rings instead of diamond ones. These engagement ring styles are as unique as the celebrities who wear them. Halley Berry, Olivia Wilde, and Jacqueline Kennedy Onassis are among the “power women” who have had emerald engagement rings presented to them by the men who became their husbands. There many reasons why gemstone engagement rings have made a comeback not so much for their less expensive price tags as to the careful selection and endearing thoughtfulness that went into the choice. 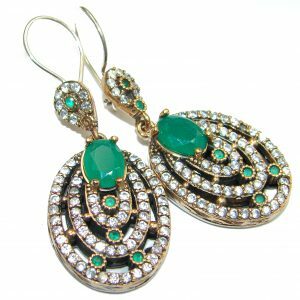 Emeralds are popular because they connote fidelity, hope, fertility, and prosperity, to name a few meanings attached to them. What more can a couple ask for when they all those symbols of true love? 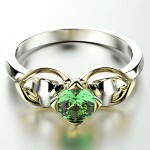 Some couples go all out and have emerald engagement ring sets because these have several advantages. You save money when you buy a set instead of purchasing an engagement ring and wedding band separately. A set is designed specifically to incorporate both an engagement ring and a wedding band into a single piece of jewelry. This uniformity is appreciated by a majority of brides. 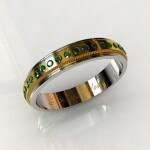 Many jewelers have fantastic deals on emerald engagement ring and wedding band sets. Consider these deals as purchasing jewelry by bulk. Moreover, a set gives the bride an elegant style that lasts long after the wedding ceremony. 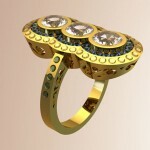 Instead of two different jewelry pieces, a set looks like one magnificently-crafted ring. A set also means you only have one style to be designed and one payment to make. What’s the Best Thing about an Emerald for an Engagement Ring? You are obviously less likely to meet someone with exactly the same engagement ring if yours has an emerald as the center stone. Most jewelers agree that only 3% of emeralds in engagement rings are sold while engagement rings of round cut diamonds comprise 75%. 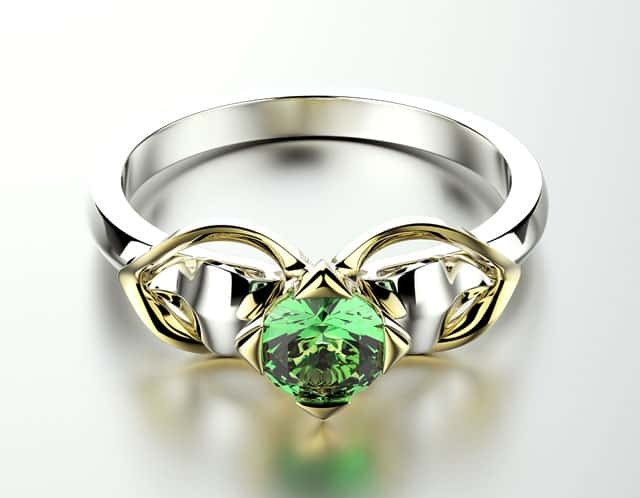 By choosing emerald for your engagement ring, however, you are assured that it has been tailored exclusively for you. The most important aspect of an engagement ring is its setting and style. Think about how the emerald is going to be displayed; whether it is to be flanked by diamonds or other stones or would it stand alone. Traditionally, the other stones are diamonds but there are jewelers and clients who would prefer an engagement ring characterized by color vibrancy, in which case there will be diamonds, sapphires or rubies. 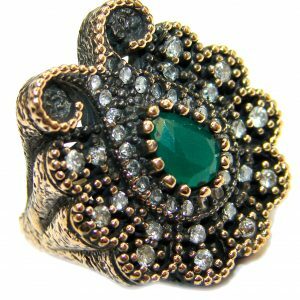 Note, however, that if the emerald is less brilliant or smaller than its surrounding other stones, it would definitely be overshadowed. 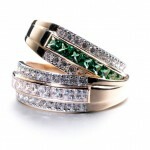 The pave style is usually chosen for emerald gemstone engagement rings with tiny diamonds around their edges. 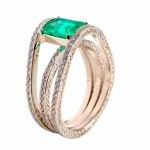 Others prefer a halo of diamonds around the emerald like Olivia Wilde’s fiancé Jason Sudeikis. The ring’s material should also be considered. 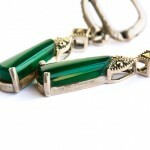 Typical metals that go well with emeralds include white gold, platinum, rose gold, palladium, and yellow gold. Yellow gold, contrary to popular notion, will not be a good metal to pair an emerald with since the dazzling shine of yellow gold would tend to eclipse its sheer brilliance. White gold is the most suitable metal for emeralds. Buying an engagement ring and a wedding band online costs 20% less according to experts because the additional overhead costs are not passed on to the customers. Online retailers also have a much wider selection of styles that an engaged couple can choose from, unlike their physical, in-store rivals who have limited stocks on hand. Some of these well-stocked online jewelers include James Allen and Blue Nile, Inc. While an engagement ring is traditionally bought from jewelry stores, online engagement rings are now the choice for convenient shopping. While most people consider buying such a momentous piece of jewelry on the internet less personal, there is nothing wrong with it for as long as you are purchasing it from a reputable seller. There are, however, a few things to look for when buying an engagement ring online. 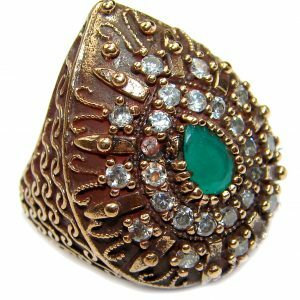 Before you even choose an online jeweler, read the store policy on returned items since gemstones are difficult to appraise online and you may not be satisfied with the ring. The retailer’s policy should allow a return of the ring within 30 days, or a month, after your purchase with a full, money-back guarantee on refund. You may want to look up retailers that offer free shipping, too. Buy only from an official website to avoid being scammed. Moreover, buy from a site which features its styles and designs as high definition (HD) photos to allow you to see any imperfections or flaws in the gemstone, according to Ira Weissman, founder of a diamond shopping guide, TruthAboutDiamonds.com. Both Ritani and James Allen have HD videos for the stones they sell online. 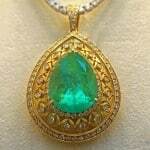 Unlike diamonds, emeralds do not need paper work to be authenticated as genuine. Diamonds need certifications from either the American Gem Society (AGS) or the Gemological Institute of America, Inc. (GIA). Both organizations are adept in analyzing diamonds using the so-called “Four C’s” of carat, cut, clarity, and color. A certification from either the AGS or GIA grades the gem and determines the value. 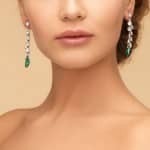 Ideally, you should have your emerald graded by GIA, AGS or the American Gem Trade Association (AGTA) since not all retailers and jewelers accept grading systems of privately-owned jewelry appraisal companies. 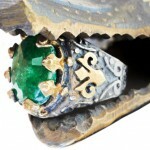 Some retailers, though, grade their own emeralds after an assessment by an in-house gemologist. If this is the case, ensure that the emerald’s size, color, transparency, and shape have been listed in a grading report. Moreover, any treatments done on the emerald should also be indicated. One thing that a grading report will not have is the emerald’s value because this is dependent on current marketing conditions. 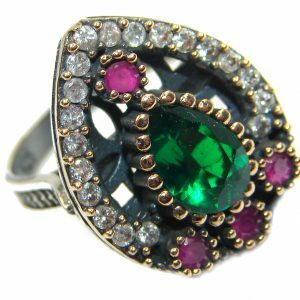 You can also obtain an appraisal of emerald engagement rings from insurance companies that conduct their own reports to ascertain values of specific gemstones, including emeralds.